In this composition I can't get the Build List node to execute properly. Show events indicates it is firing every second but not the chain for building the list. Have tried countless variations. I've also reduced the issue to a four node concept where it should but fails to work and logged a bug report. Also in the attached composition i put a cube in the scene just to see if the window could render anything else and made the cube very small with scale but it remains large filling the entire window. I added a draggable camera and still i cannot drag away from the cube enough that it isn't filling the Window. Excruciatingly frustrating to have basic problems like this. 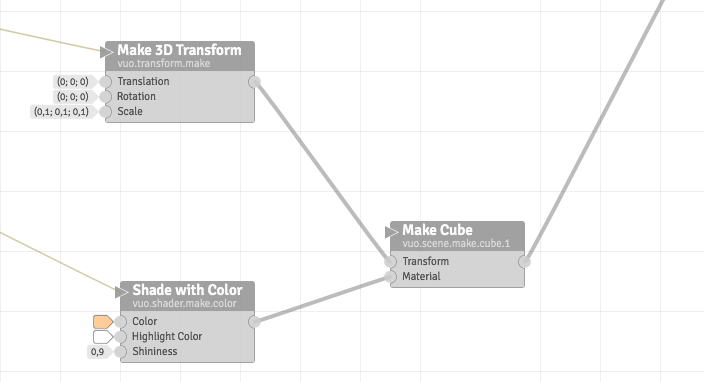 For the big cube not scaling down it is because your "make 3D transform" node has no event cable connected to it. Therefore the cube stays big. Just connect it to fire on start. 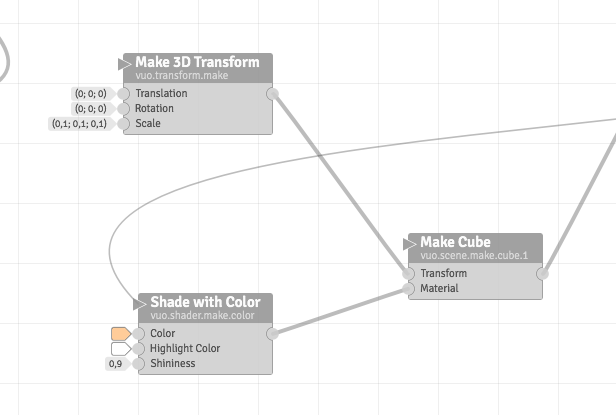 But why are you connecting the "shade with color" node to the same cube to requested frame ? That is for the big cube issue. I will look further into the other problem you mention. Joined the modified comp with connected event cable. 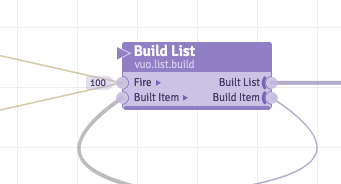 Concerning the why is this build list node not making a list it is all related to the cables and events. There are some false connected cables. There are also some connected cables that doesn't need to be and that overload the composition. I have deleted the unconnected nodes from your composition and tinted the nodes to make it easier for me to understand. You have connected the "fire on start" and "fire periodically' cables to the main refresh event port on the build list node (screenshot 1) but it should be on the "fire" port (screenshot 2). That's why when you check the outgoing data from the "Build list" node, you'll see it has no events outgoing (Events screenshot). 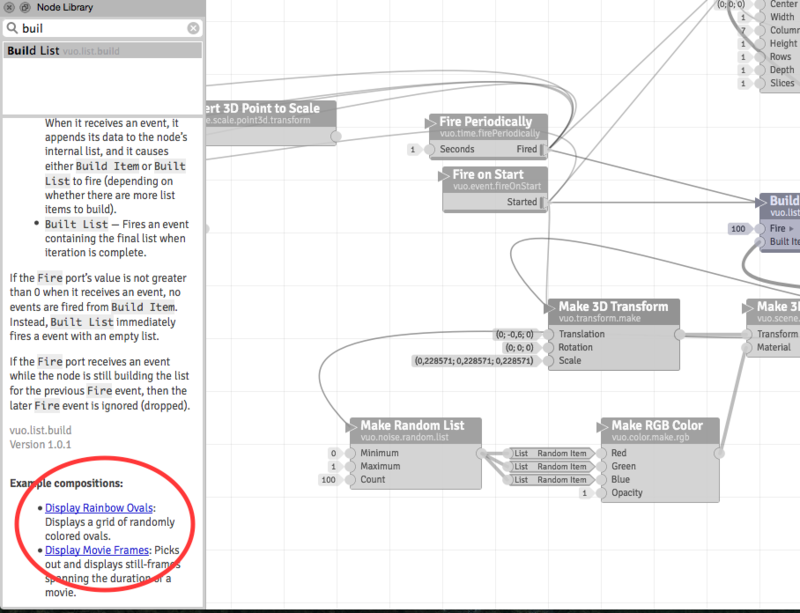 When not sure on how a node should be connected, I encourage to search the node in the node library, and below the node information, there are some sample compositions linked that use that node (Node info screenshot), opening it shows a composition with the build list node connected (screenshot 2). As asked and discussed really often on the discussion and Q&A sections (it seems a redundant fault people make and which I make too) and for what Jaymie has created and answered a question here Why is the output process ..., external incoming cables will bug the Build list and process list nodes. For example, you attached the "Make 3D transform" node for the triangles to the "Fire on start" node (Shot 3). This may eventually cause glitches. 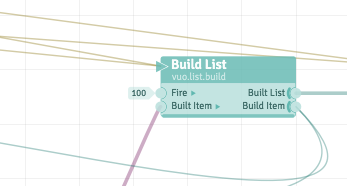 One option I guess is to link the outgoing "Build Item" port from "Build list' to an "Allow first event" node connected to the "Make 3D transform" (Shot 4). You have got some unnecessary connected cables going. This could make it harder to focus on the issue and also overloads the composition with some unnecessary heavy stuff. Keep in mind that A NODE POSITIONED AT THE FIRST POSITION OF A NODE CHAIN needs an event cable (a one event only or repetitive one) to start, BUT THAT DOWNSTREAM NODES USE THE EVENTS FROM THEIR UPSTREAM CONNECTED NODES (in case events are not blocked by walls, see the manual). 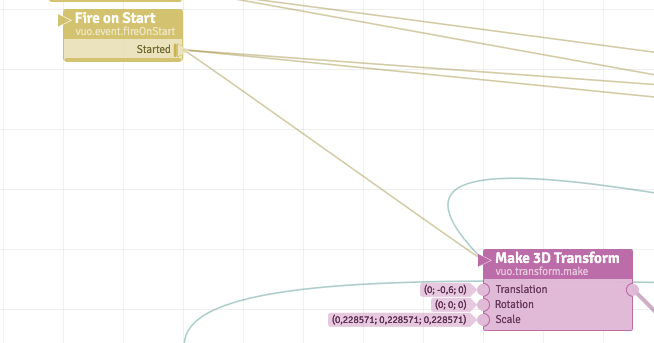 This means, for example, that you don't have to connect the "Arrange 3D objects in List" node to some event cables (Shot 5) as it is already receiving event from its parent nodes. These can be removed (Shot 6). Connecting them to such event port as "Requested frame" is even heavier, as this means these will be refreshed at f.e. 60 fps. Connecting stuff to "Requested Frame" of course make sense for things you want to change at that framerate, but not for a solid unchanging color like described in the other part of the question about the big cube. Hi BodySoulSpirit thanks for the great answers, the reason for connecting Shade with Color to Window was just out of desperation! when i can't get nodes firing i just tend to keep adding event cables trying to get something to jog my comp into success :-) I lack confidence in my ability to predict event behaviour at this stage. And even in Show Events mode it isn't completely obvious to me all of the nodes that are firing and when. I realise by connecting to Window Refresh output it's firing an event every screen refresh which is uanessacry for a static value but just grab it cause it was nearby, i had lost patients at this point. I'll comment the Make triangle thing on the bug report. Alastair what is still unclear to you regarding events ? Can you be more precise about what you mean with Event behavior at this stage ?